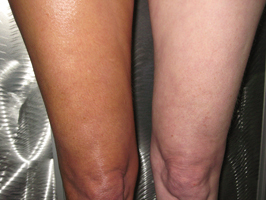 A personalized airbrush tan can do things you never dreamed of. People might even think you’ve had work done because you look so good! Think we’re exaggerating? We aren’t. Do you have cellulite? If so, you might spend a ton of money on creams, lotions, lasers, voodoo, and fairy dust to try to cover it up. We hear you. It’s frustrating! But did you know that an airbrush tan can reduce the appearance of cellulite? It really can! People are often shocked at the results. Do you suffer the same frustrations with stretch marks? Same applies! An airbrush tan can do wonders to reduce the appearance of stretch marks as well! Do you have dark or varicose veins? Guess what! We can help you hide those too! Age spots? Scars? Blemishes? I think you get the picture… An airbrush technician will apply the right color in the right way to blend your skin tone and hide these unsightly marks. Airbrush tans are like white-out for your skin! It can also make you look more toned and sculpted. You can even look like you’ve got more cleavage! Your whole body will transform. People spend thousands of dollars and undergo dangerous treatments to get a look that you can mimic with a simple, safe, affordable, 10 minute treatment! Why *wouldn’t* you give it a try? !